Four years after the release of the original Rayman and plenty of celebrated success, Ubisoft released a sequel that changed the concept of the series entirely. Unlike the original cartoon-like platformer that was tough as nails, we were greeted with a dark, 3D rendered platformer. While the jump to 3D was hit or miss for various gaming staples, Rayman found a welcome home with Rayman 2: Great Escape, touted by many (myself included) as one of the best 3D platformers ever developed. If I mention a cutesy 3D platformer that stars evil robots and pirates it would be hard to tell if I was talking about a Ratchet & Clank, Rayman, or even Conker because the idea is so recycled. While the plot may remain the same, that’s where the comparisons end. Instead of the aggressive worlds that had one goal – to kill you – of the original, we are now given fully rendered open environments that crave exploration. For the most part you are tasked with going from the beginning of any level to the end, but along the way you also collect the glowing lums from the original. For the lums that are on your path and along the way this is no big deal and it will surely get you to end of the game, but if you want to unlock everything you will have to find all 1,000 lums. That is where the game goes from a simple level-to-level game and becomes a test of platforming abilities and risky gameplay. It felt a lot like the convention we saw in Super Mario Galaxy, where the game can literally be as hard or as easy as you like, but back in 1999 this was a new concept. 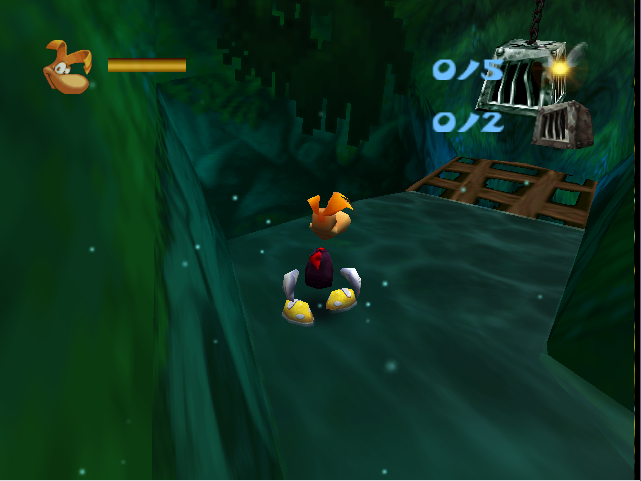 Rayman 2 is also much easier as a whole, which allows you to appreciate the game and environment instead of threatening to destroy your controller with every new turn. It’s just a fun ride with enough levels to secure a 6-10 hour campaign. Portable gaming has been around almost as long as gaming as a whole. Since the first moment bleeps and bloops could be captured on a screen, engineers have been hard at work trying to recreate the same experience on the go. Now with both the Playstation Vita and Nintendo 3DS this goal has, for the most part, become a reality. While neither is quite on par with the likes of their HD gaming counterparts, there’s no doubt that the smaller screen does make the distinction difficult. Having personally played Resident Evil: Revelations, Super Mario Land 3D, Wipeout 2048 and Uncharted: Golden Abyss, I admit that I feel these games are nearly identical both in gameplay and graphics to home console titles. This is nothing new, in fact many would argue that the Playstation Portable was nothing but a slew of PS2-style titles both unique and ported. Unlike the PSP, though, it appears that the gaming public claim this is what they want. The sales, of course, tell a different tale.